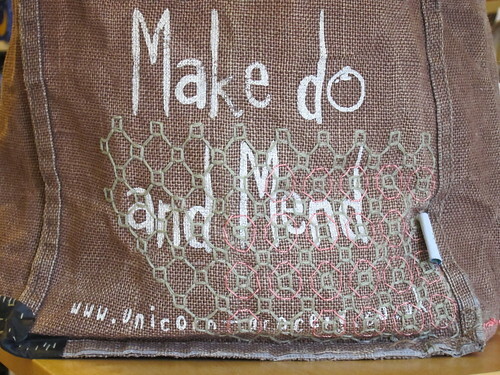 Looking back, I started working on patching my Make do and Mend bag almost exactly one year ago. It feels longer, possilby because it was written on every to-do list for a year. Yesterday, I finally finished stitching the new lining in. This morning, I used it around the shops and going to the People's History Museum, and it held up just fine. 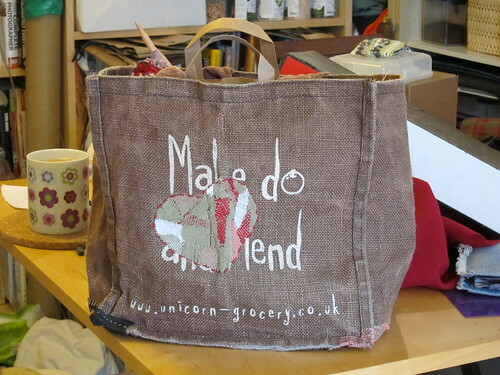 Those aren't the bag handles sticking up- there's a brown bag with my current knitting project inside the Make do and Mend bag; the edge is just visible on the needles. The knitting hasn't been done on the bus, but I have been putting together the strips of fabric and winding it into a ball of "yarn" while commuting, and on the train after visiting a friend in Disley. It isn't easy to knit with fabric yarn, but it does feel nice. The other side of the bag has some green and pink embroidery in a blackwork pattern. Overall, I'm happy with the project and I think I'll enjoy using the bag again. It did drag on. When I started, I didn't realize I would need to line the bag. The lining was hard to figure out, and I'm sure there's better ways of doing it, but at least it is done. I have a new favourite phrase (from English as she is spoke), "A bad arrangement is better than a process." It describes my crafting a bit too well.